Plein air painting (painting outdoors) presents several unique challenges to the artist. Changing light conditions, weather and insects to name a few, not to mention translating the vast landscape onto a small canvas in a short length of time. In this video (runtime, 2 hours, 20 minutes), I demonstrate my step-by-step approach as I create a plein air painting from start to finish in beautiful Ojai, California. Join me as I take you through my process and give important principles for the plein air artist to remember. As I develop my painting, I share a simple approach that can help you achieve success with your own plein air paintings. Scroll down to read endorsements for the DVD from many of today’s top painters! Click here for a list of the painting supplies I used during the filming of the DVD. 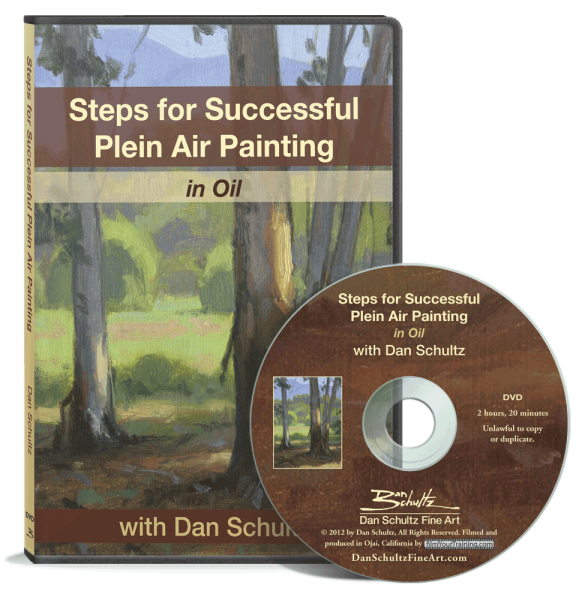 “Steps for Successful Plein Air Painting ” with Dan Schultz is very well done. It is interesting to see the artist pick out his subject and to see the progression of the painting as he works through to the end. This CD is most informative and worth watching many times. As a former trainer for the Navy, I am aware of the quality of training products that are offered to the public. Dan’s DVD is logical and clearly geared to make a student’s beginning steps in plein air productive and less frustrating. It is a great aid for the more advanced painter to revisit the basics, a practice that yields great benefits. It is produced with the goal of ensuring a pleasant experience and gaining confidence in an often bewildering pursuit. Well done Dan! Dan Schultz is a consummate painter. His DVD is well done, the step by step information was clear and easy to understand. Watching the video feels like having a front row seat during a workshop. One can easily watch how paint is mixed, the importance of comparing values, the application of paint, and the thought process to complete a successful plein air painting. I highly recommend this informative DVD to all. 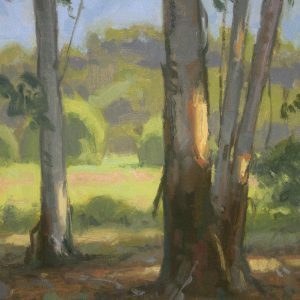 Dan Schultz’s video lays out a practical approach to plein air painting. What can seem so complicated and overwhelming to the beginner painting outdoors is presented in a logical progression of steps. The importance of strong composition and control of values are stressed. Dan shows how to simplify the elements within the picture by leaving out extraneous detail, blocking in the major shapes and then adding subtlety. He displays a painterly style that looks contemporary. There are many good insights to contemplate. It boils down to using one’s artistic sensibility combined with lots of practice, hard work and persistence. This DVD is a wonderful opportunity to watch and learn from an evolving and exquisite painter of the “plein air” in our time, Dan Schultz. Dan talks about the things to consider in the challenges and pleasure of painting in the open air, from elements to equipment to settings, materials, brushes, composition, design, color value and more, as we watch the painter work – over his shoulder, witness the scene and steps in the process of good painting by an excellent teacher… like wathcng a secret – the painter at work and hearing his mind put it all together. I’ve watched it again and again, getting so many informations about Plein-air painting, from searching the right spot over color mixing, brush strokes and composition to the finished painting. Can highly recommend this particular DVD. Every step is easy to follow, even for foreign Bavarian artist like me.